On Wednesday January 29, the Centennial boys’ basketball team took on Oakland Mills in showdown of the top two teams in the county. The gym was packed and there was a playoff-like atmosphere. Centennial got off to a 7-0 start in the first quarter, which was highlighted by a dunk from senior guard Isaiah White to extend Centennial’s lead to 9-1. The Eagles dominated the first quarter on the offensive end, defensive end, and on the boards, and it ended with a 15-9 Centennial lead. The second quarter was the same. Senior Chad Strothers and junior Tom Brown continued their impressive games in the second, notching points when they needed to be scored. Senior Kevin Wilson was a force on the boards in the second quarter, helping to facilitate the Eagles offense. White made another exciting play, igniting the crowd with a dunk that gave the Eagles an 11 point lead. The Eagles defense stood tall in the second, helping to preserve a 30-22 lead at the half. The third was another strong quarter for the Eagles’ offense. Brown had a very good quarter, leading the Eagles out to an 8-3 run to begin the quarter. The Eagles and Scorpions went back and forth in the third quarter, which ended with Centennial on top 43-35. The stage was set for an exciting final quarter. Oakland Mills got big rebounds early in the quarter to pull within 3. The Eagles held off the push from the visitors, but the Scorpions’ momentum carried them to take the 1 point lead a little over three minutes into the fourth. With the visitors controlling the boards and the Eagles struggling to get calls in the paint, Centennial was in an uphill battle in the home stretch of the game. The teams traded baskets, one team never holding the lead for very long. With the visitors holding the momentum and time running short, the Eagles found themselves down by three points. This did not seem to bother White, as he drained a long three pointer that not only tied the game, but got the home crowd back in it but energized the team. With just under 10 seconds to play, Strothers hit a free throw that put the Eagles ahead. However, with five seconds left, Oakland Mills hit two free throws that tied the game and sent it to overtime. The overtime period was back and forth in the beginning, with the two teams once again trading leads. Brown, White, and Strothers helped score points but Oakland Mills would eventually escape with a 66-61 win. Strothers, Brown, and White would finish with 18, 17, and 15 points respectively, with Wilson adding three more. Senior Connor Clemens and Junior Min An both finished with four points. The Eagles also got strong defensive play from Senior Eli Giest, who made some key blocks down the stretch. On Jan. 24, student performers of Centennial High School got together to put on a show full of music, dancing, and a lot of laughter. With comedic skits, Awkward improv, and as much ice cream as you wanted, Fat Night Follies was a hit. On Jan. 14, Centennial boys’ basketball not only improved their undefeated record to 10-0, but they also broke River Hill’s six game winning streak. The game started out slow, and it was several minutes until senior Kevin Wilson sunk a three to put the first points on the board. The first quarter ended with Centennial up 11-8. In the second quarter, the game seemed even slower than the first half for Centennial’s offense. Senior Isaiah White’s allyoop dunk was the brightest spot of the first half, and by the end of the half River Hill had caught up and then grabbed a one point lead. However, the game picked up in the second half as Centennial, led by Brown and senior Chad Strothers, went on several scoring runs. 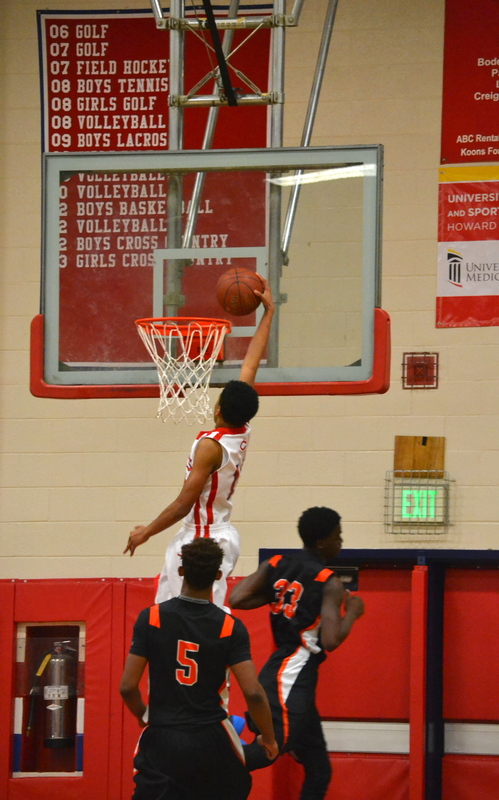 Additionally, Centennial managed to shut down River Hill’s leading scorer for the season, Charles Thomas IV, who had previously been averaging 22.6 points a game, according to The Baltimore Sun. “We knew we had to get him in the post and cover him well there. Kevin did well fronting him, and we got him off the boards,” said Brown. The Eagles held Thomas to just nine points, a season low for him. By the end of the third quarter, the Eagles had pulled ahead by five with a score of 32-27. They continued to control the game with strong defense and a steady offense. Since boys’ basketball does not have a shot clock, Centennial took its time passing the ball around the perimeter as they worked the zone, looking for openings. The Eagles then capitalized on those openings, with five players sinking threes throughout the game, and multiple two point field goals made by different players. Centennial maintained its lead until the end of the game and won 49-39 thanks to its strong defense and several key players. Brown dominated the boards with 10 defensive rebounds and 1 offensive one in addition to his 3 steals and 12 points. He was helped by teammate Strothers who had an astounding 17 points, 6 assists, 4 rebounds and 4 steals, as well as White (10 points, 2 blocks) and Connor Clemens (5 points, 4 rebounds). This win will carry the Eagles on to their next game at Hammond on Jan. 16. 97 students were inducted into Centennials National Honor Society last night. Their advisor, Mrs. Bagley, delivered opening remarks, followed by a light hearted speech from the Keynote Speaker, Mr. Matchim. School principal Mrs. Hafets delivered the closing remarks. Congratulations to all of NHS’ new inductees! Centennial High School Freshmen are cramming for their first midterms ever. Teachers help them prepare, not only giving them study guides, but also holding study sessions after school. These sessions are on Tuesday, January 13 thru Thursday, January 15 from 2:15 pm to 3:45 pm. After the study sessions, the school is providing an activity bus that will take students home. Students who want to ride this bus must sign up on Sign Up Genius. Also, on Saturday, January 17, there will be an additional study session held by the CHS Honor Societies from 9 am- 12 pm. Teachers want to help the freshman class as best they can. The study sessions are optional, and can be used for extra questions, more time with the teacher, and to further the students’ understanding of the information on the midterm. 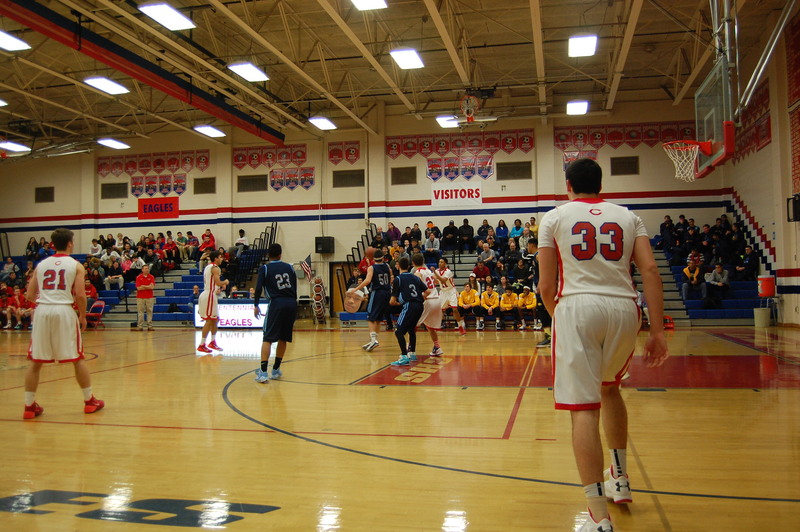 On January 9, Centennial’s boys’ basketball team beat Marriotts Ridge at home, 84-62. They remain undefeated in the county and have only one loss against an out of county team. 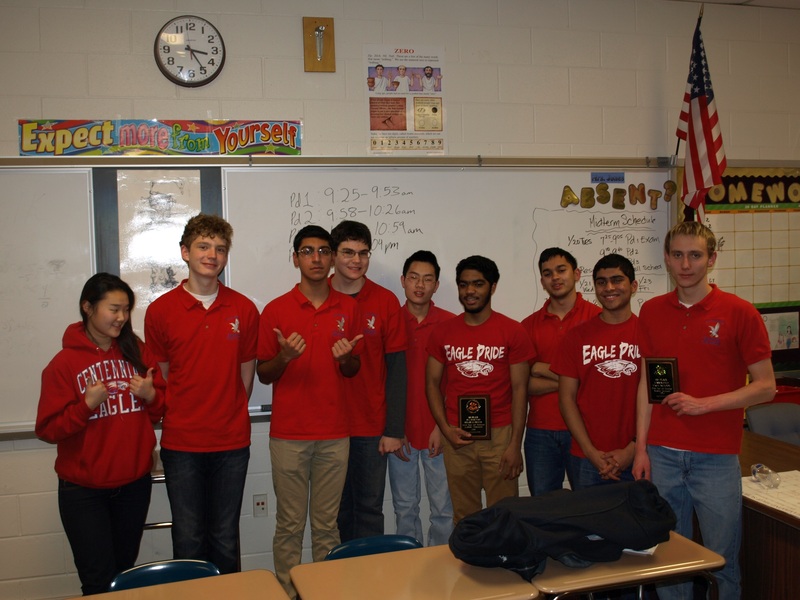 At a recent Hammond High School It’s Academic Tournament, Centennial High School’s A Team, featuring Ryan Heslin, Anant Mishra, Mohammed Khader, and Weijia Cheng, placed first, continuing their three year winning streak. Other Centennial teams also performed exceptionally well, with the B Team finishing in fourth, the C Team in fifth, and D team in ninth amongst a field of 36 teams. Even then, several of the Centennial teams were eliminated when they were forced to play each other due to the design of the event’s bracket. Looking forward, the A and B Teams have qualified for the Partnership for Academic Competition Excellence’s (PACE) tournament, in Reston, VA, and are applying to the High School National Tournament in Chicago. They are hoping to improve on last year’s respective 18th place (out of 96) and 13th place (out of 272) finishes from last year. Additionally, Mishra believes that their spectacular showing at Hammond did not even indicate their true potential. With a combination of this advantageous format and many hours of careful practice, the It’s Academic teams will be tested on June 6-7 during the PACE and on May 29-31 in the High School National Tournament.